4 But when the kindness and love of God our Savior toward mankind appeared, 5 he saved us—not by righteous works that we did ourselves, but because of his mercy. He saved us through the washing of rebirth and the renewal by the Holy Spirit, 6 whom he poured out on us abundantly through Jesus Christ our Savior, 7 so that, having been justified by his grace, we might become heirs in keeping with the hope of eternal life. “In the name of the Father and of the Son and of the Holy Spirit.” You’ve heard these words and already you have a picture in your mind where you’ve heard them. Was it at the beginning of today’s service? When the pastor forgave your sins in the absolution? Or when our latest member, baby Brooke, was brought by her parents to be baptized “In the name of the Father and of the Son and of the Holy Spirit.” When baptized the pastor makes the sign of the cross on the heart and on the head to mark you as a child of God. I would suggest that you can always remember your baptism when you hear these words. Today, while standing the baptism font at the beginning of worship I said, “In the name of the Father and of the Son and of the Holy Spirit” to remind you that the Holy Spirit put or sustained faith in your heart at your baptism. Then during the Absolution I said the same words to remind your head (having confessed your sins) that you are forgiven by this same Jesus. Jesus was the first to use these words when he sent the disciples out to make disciples “In the name of the Father and of the Son and of the Holy Spirit.” When we use these words at the beginning of our service we are reminded that our identity as worshipers are baptized children of God. When we confess our sins and hear the absolution we can remember that baptism is God’s power to daily drown the sinful nature in our baptism. When Luther wrote his Catechism to teach fathers how to teach their children to pray, he suggested that we begin our morning and evening prayer by remembering our baptism as we pray, “In the name of the Father and of the Son and of the Holy Spirit.” But, why? Jesus often spoke about his relationship with his Father and the Holy Spirit. He spoke to Nicodemus about this relationship involving the Holy Spirit and his Father. He instructed his disciples about this relationship before his suffering and death. This relationship was seen at Jesus’ baptism when the Holy Spirit was there in the form of a dove, the Father was heard in the booming voice, and Jesus was in the Jordan. But, why? What’s important connection between the Father, the Son and the Holy Spirit? St. Paul wrote about this connection to young Pastor Titus who was doing ministry on the Island of Crete. This was difficult work. There were troublemakers on the island and Paul had some sharp words for them. “They claim to know God, but by their actions they deny him. They are detestable, disobedient, and unfit to do anything good”. These people were not good! They were standing in opposition to God and putting roadblocks in the path of others who wanted a relationship with God’s goodness. But, Paul had more to say and it was a bombshell! “For at one time we ourselves were also foolish, disobedient, deceived, enslaved by many kinds of evil desires and pleasures, living in malice and jealousy, being hated and hating one another”. “12 So then, just as sin entered the world through one man and death through sin, so also death spread to all people because all sinned”. separated from God’s kindness. You see the need for forgiveness because you hear Scripture declare that we all have this sin nature. This is sin’s curse on mankind—separated from God’s kindness, dead as far as life with God is concerned, are destined for hell. Why? Because that is what God’s Word says. You might get a hint of God’s yearning to save us when you are visiting a loved one that is battling cancer, or has been in a terrible accident. You might get a sense of God’s compassion, love and kindness that filled his heart for you and me. And our compassionate, loving and kind God did something according to his mercy! He cured the spiritual cancer, healed the spiritually wounded heart and saved the dying from hell. What Jesus won for us on the cross becomes our very own through the water, connected to the Word of God, and brings us the renewal, the rebirth, the spiritual awakening, yes, restores our relationship with the kindness of God because Jesus’ work of washing away our sins through his blood, becomes our very own through faith in him! This kindness comes to us “In the name of the Father and of the Son and of the Holy Spirit.” God the Father sent his Son to do the work. Jesus defeated the power of Satan, paid the punishment of sin, and conquered the curse of sin. The Holy Spirit did his work to bring forgiveness, life and salvation to you. Our spiritually dead nature in the heart now beats with a new nature, a new man, a new life in Christ as we rejoice in this Kindness from God. “In the name of the Father and of the Son and of the Holy Spirit.” These words put God and us back together again. These words make us and our children part of God’s family. These words place us on an earthly journey the ends in heaven. These words declare God’s kindness for us in Jesus Christ. 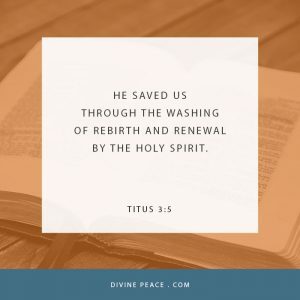 “He saved us through the washing of rebirth and the renewal by the Holy Spirit, 6 whom he poured out on us abundantly through Jesus Christ our Savior.” Jesus is the power, because Jesus is the Word! Recall St John’s declaration: “In the beginning was the Word, and the Word was with God, and the Word was God. 2 He was with God in the beginning. 3 Through him everything was made, and without him not one thing was made that has been made”. In Jesus God has declared you not guilty by his undeserved love for you. In Jesus you are the ones that will inherit heaven. In Jesus you have hope, peace, joy, love… yes, the kindness and love of God for you “In the name of the Father and of the Son and of the Holy Spirit.” Believe it! Today we remember the baptism of Jesus. At the Jordan River Jesus is anointed with the Holy Spirit to fulfill the righteousness of God. Right there you see God’s saving plan in action. God’s plan of salvation is yours in baptism. In your baptism you have the Father’s kindness, the Holy Spirit’s renewal, all for Jesus’ sake. Today you might walk into your home and no one’s home. You probably won’t feel alone. But, the day will come when you will attend the funeral or memorial service of someone you love, you will face the disease or tragedy, you will have a broken relationship, you will be tempted to feel all alone! That is the day that you need to keep your ears wide open to the words you hear in this place of worship, “In the name of the Father and of the Son and of the Holy Spirit.” Remember the kindness from God to send his Son Jesus for you. Remember God’s kindness for you to make you his very own in your baptism so that you are never alone. Yes, Rejoice in God’s baptismal kindness “In the name of the Father and of the Son and of the Holy Spirit.” Amen.